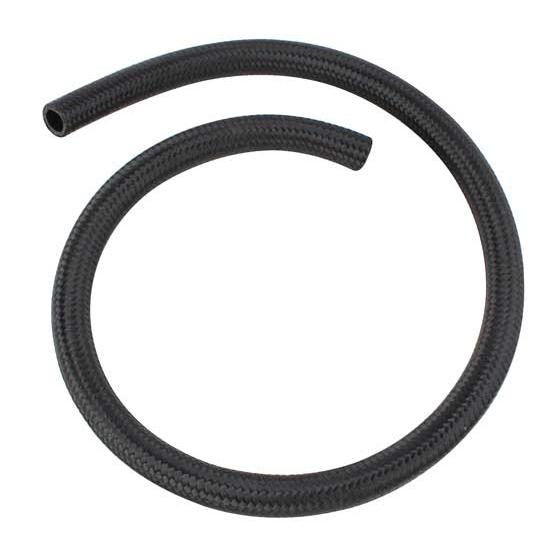 This lightweight motorsports inspired hose has a rubber core, flexible braided nylon cover in a black color, and is resistant to oil, fuels, and coolants. Features a 500 psi working pressure and an operating range of -40° F to +300° F. Designed to be used with both crimp style and full flow type fittings. Vacuum Rating: 28 in. hg. Weight Per Ft.: 0.120 lbs. Minimum Bend Radius: 3.5 in. Works great as a fuel line for gasoline and alcohol fuels.